Video Event of the Week: Might Lionsgate's DVD of The Expendables, the over-the-hill-gang action flick starring Sylvester Stallone and geriatric friends, conceivably be what we're talking about? Could Magnolia's Blu-ray of I'm Still Here, Casey Affleck's hilarious pseudo-documentary about Joaquin Phoenix's year of living weirdly, possibly get the nod? Or -- and I think this is unlikely -- might Universal's respective disc versions of Murder She Wrote: The Complete Twelfth Season, starring Angela Lansbury as America's most dangerous houseguest, by some odd chance actually be The One(s)? 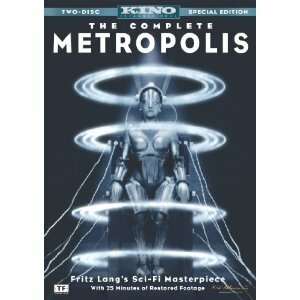 All worthy to be sure, even that last, but for my money -- and this will come as a huge surprise to absolutely nobody -- it simply has to be Kino Lorber's DVD and Blu-ray versions of the newly (and almost completely) restored version of Fritz Lang's visionary 1927 sci-fi masterpiece Metropolis. I've been haranguing you guys about this one pretty much non-stop since they announced the discovery of the 25 minutes of lost footage back in 2008, so I won't bore you about it further. Let's just say this is the most important home video release of the year and that your life will be the poorer for it if you don't check it out. Oh, and of course -- you can order it over here. Best or Worst Non-Documentary Holiday-Themed Feature Film!!! If only for P.J. Soles, as cinema's most memorably slaughtered horny teenager. Because nothing says The True Spirit of Christmas more than an unfunny comedy starring Arnold Schwarzenegger and Sinbad. The Abbott and Costello movie for people who hate Abbott and Costello. As far as I'm concerned, the entirety of Passover is a plot to keep me from having a decent corned beef on rye for a week. But seriously, ladies and germs, any biblical film with Dan Hedaya as an ancient Israelite with a laughably fake beard is okay in my book. For the film within the film -- Home for Purim. Which of course is ultimately retitled Home for Thanksgiving, but never mind. Alrighty then-- what would your choices be? I did not watch this movie. but after reading this article i want to know more about it. my writers of online experts http://www.gethomeworkonline.com/write-my-college-essay write me an assignment so i enjoy these kind of movies with friends. Funny Easter egg images are for your own use only.These happy Easter images are not our copyright these are copyright to their owners so we are not responsible for any claim.You can use these for your own purpose not commercial.